Thank you for the answers, guys. That was exactly the discussion I read some weeks ago but I wasn’t able to find it again. From my point of view I see a “normal” wing with a normal wing twist (bigger inner angles and lower outer angles) in order to have the correct stall response. 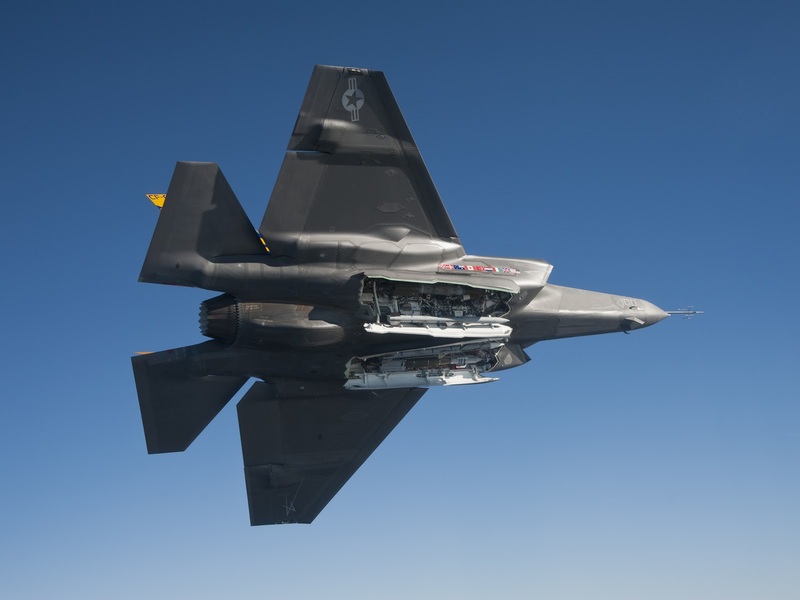 So what I expect is that Sidewinder missile on the external pylon is a little bit rotated down and it is normal that this effect is more evident on F-35A and B shorter wing. The Sidewinder seems to be “parallel to its wing section” in order to cause a reduced drag to the airflow around it. On C variant the Sidewinder pylon is farther away from the wingtip than on A and B and so it is also less rotated down. In other words, more than with the angle of attack during the launch, I see a correlation between pylons and wing twist. Or better…I see it for all pylons on C variant, but only for internal and external pylons on A e B variants. The mid pylon on A and B variants is something that is not clear for me and if its “abnormal”angle (connected to the "spacer" highlighted in red in image below) is due to some reason about “safe separation”, it is not so evident for me how it exactly could solve the problem and why a bigger (but similar) wing on C version does not cause those separation problems or a so different air flow around the wing that requres that "spacer" on A and B.
is there someone who knows why weapons bay doors on F-35A and C have not staight borders as in the first prototype? Thank you. The only reasons to add complexity to the F-35 are reduced cost, weight, or RCS. As changing the design does not seem to reduce cost or weight I would suspect RCS. The key difference between AA-1 and production F-35s is the SWAT weight reduction measures taken in the early 2000's. 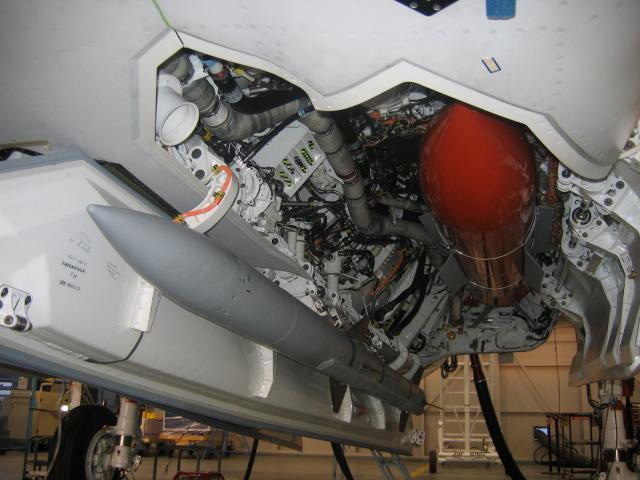 Part of that resulted in changes to the OML underneath the F-35A/C. It looks like that area is a cut-out from one door in order to give an AMRAAM clearance for the forward fins as the door opens. I would need to see a pic from below with just the AMRAAM door open to see. The F-35B still has a straight edge. So it could be tangentially related to weight reduction. I stand corrected. The cut-out for the forward AIM-120 fins was also my suspect, but the absence of the cut-out on the F-35B and on the prototype is the reason why I wasn’t sure about that. Instead, the rear “tooth”on the internal door seems to cover the door locking system, but on the F-35B is also in the same position of the rear AIM-120 fins. On the prototipe the rear and the frontal teeth are not present. I’m not sure about that, but probably they decided to reduce as much as possible the dimension of the internal door in order to reduce the drag when it is open. F-35B has a different bottom, different bay and also a particular function for the internal doors that are open during vertical landing. It coud be that a straigth border is better for F-35B. Last edited by spazsinbad on 20 Sep 2017, 03:59, edited 1 time in total. ...not to detract but what the heck is on that centerline? ?.....not the gun! Size wise it looks like a center line installation of small diameter bombs. It is a graphic / artist impression so the graphic may be a bit wonky. ZOOM zoom. Yes it is curious if Babione is ONLY referring to the graphic however he is likely talking about some maximum Beast Mode configuration (not on show). Sure people make errors & misremember their talking points (seems like Babione was prewarned by interviewer Muradian about questions). Perhaps there will be later clarification? Dunno. We'll see eh. "Beast mode" came out a while ago and yes, it's about full internal & external load-outs.